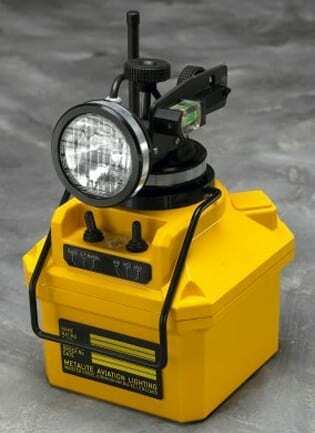 A battery powered portable approach light suitable for night-time use enabling pilots to identify the runway centreline during approach. UAL portable approach lights can be used to mark the approach of both runways and helipads, with the pattern of deployment set to meet the particular requirements of each application. The units produce 3 levels of light intensity up to a maximum of 600cds, these can be factory set to provide either a flashing or steady signal. For increased stability the lights can be mounted on individual base plates that are anchored to the ground. Once positioned the desired approach angle can be accurately set between 2° and 8° using the UAL’s integral scale and spirit level. 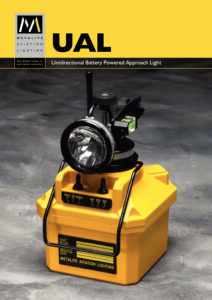 2 12V sealed lead acid batteries contained within the portable approach lights provide 16 hours continuous operation when used at maximum intensity. Recharge is achieved in approximately 8 hours using the simple drop-in charging system employed on the CALKIT™ trailer or the freestanding battery charger.